Machine Dazzle empties a box of industrial-strength ear plugs onto a table and begins unwrapping them one by one. It’s quiet in the hallways behind the stage adjacent to Rose. Rabbit. Lie. that will soon host The Cosmopolitan of Las Vegas’ new resident show, Opium by Spiegelworld. The plugs aren’t for the performers’ ears, though—they’re for their costumes. Dazzle steps away from the table to clear space from a couch, just as a performer leaves a nearby dressing room, maneuvering cardboard boxes on her way to the stage. The workshop where Dazzle is creating Opium’s costumes is a bit of a mess right now, with yards of fabric, wardrobe racks, and half-dressed mannequins scattered throughout. It’s also a far cry from Dazzle’s wardrobe when he made his debut alongside Opium’s cast in February, descending from an escalator at The Cosmopolitan wearing an ornate dress adorned in silverware. The space-age costume—and the tin foil parkas worn by the performers–hinted at what’s to come when the curtain drops on Opium. At the time, Dazzle explained that he–like all of the show’s cast members–had answered the call of the universe to join Opium “promoter” Harry M. Howie at The Cosmopolitan. They had followed the signs in the stars, for a purpose they’d yet fully define. Dazzle is no stranger to Las Vegas, having visited the city for business and pleasure since the early 1990s. A native of Philadelphia, Dazzle moved frequently as a child, from Pennsylvania to Texas to Idaho and eventually settling in Colorado, where he attended high school and college (the latter at the University of Colorado Boulder). Following graduation, Dazzle bought a one-way to ticket to New York City to pursue his artistic dreams. A “self-taught fashion designer,” he found success despite taking a different route than most costume designers. “I went to school, but I went for fine arts,” he says. “I didn’t study costume and I didn’t study fashion. I’ve never been to a sewing class. I break a lot of sewing machines. Dazzle’s work with performance artist/playwright Taylor Mac brought him to national prominence, with the pair’s A 24-Decade History of Popular Music, heralded by a New York Times critic as “one of the greatest experiences of my life.” Yet, while he’s loved living in New York, Dazzle felt drawn back to the desert by the same forces that compelled Howie and the Opium cast to The Cosmopolitan. Opium is so shrouded in mystery, even Dazzle is hesitant to speak about his work beyond generalities, preferring to leave all surprises for the audiences that will fill the seats of the Opium Theatre when the show opens for previews on March 13. “Off the bat, I was thinking spacy, like alien,” Dazzle says of his costume ideas. 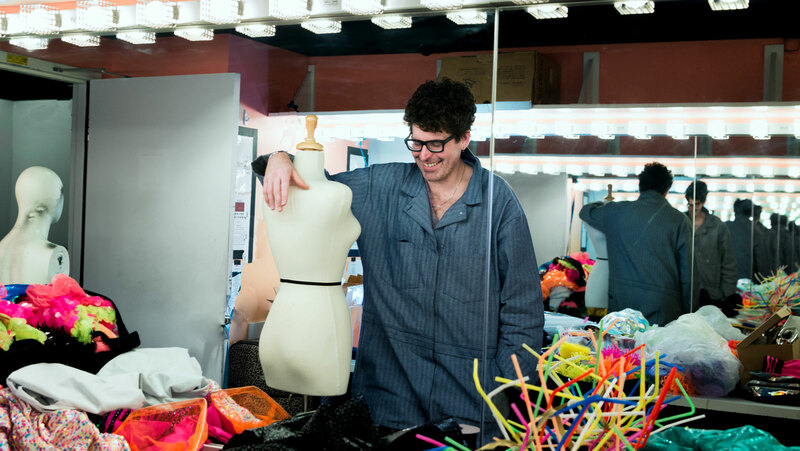 With opening night looming ever closer, Dazzle is working 12-to-16-hour days piecing together his “wacky” creations, earplugs included. Always at work, either with his hands or in his head, Dazzle will continue to play and perfect things through opening night and beyond, until he doesn’t see the need anymore.